You are currently browsing the tag archive for the ‘skating’ tag. ‘Cracked Ice’ looks like Frank Tashlin’s answer to Walt Disney’s ‘On Ice‘ (1935). However, the familiar scene of animals skating is enhanced by the presence of a pig, who is an excellent caricature of W.C. Fields, both in voice and design. When he discovers the liquor storage of a phlegmatic St. Bernard, the pig goes at lengths to retrieve the alcohol. His best scene is in which he tries to get the drinks by talking to the dog, in real W.C. Fields style. In another great scene the pig goes into discussion with someone in the audience. The cartoon ends with an elaborate magnet gag, but it’s the man in the audience, who has the last laugh. ‘Cracked Ice’ is an entertaining film, if not a too spectacular one. It was Frank Tashlin’s last film at Warner Bros. for the time being, and his unit was taken over by Chuck Jones. Tashlin left Warner Bros. for Walt Disney, where he worked on films like ‘Donald’s Vacation‘ and ‘Mr. Mouse Takes A Trip’ (both 1940). However, the Disney studio was not his style, and he interchanged it for Columbia in 1941, working on the ‘Fox and Crow’ series. By June 1942 he was back at Warner Bros. where he would direct some superb films, like ‘Plane Daffy‘ and ‘The Stupid Cupid’ (both 1944). ‘Seasin’s Greetinks!’ is Popeye’s first Christmas cartoon. It must be one of the least typical Christmas cartoons around: we watch Bluto and Popeye clobbering each other, while wishing each other ‘Merry Christmas’ and ‘A Happy New Year’, respectively. Most of the time we watch the trio skating. When Olive gives him the cold shoulder, Bluto cuts off the ice on which she sits, and she immediately drifts towards a waterfall. Luckily, Popeye saves her in a rather bizarre way. The cartoon ends with Olive and Popeye watching a Christmas tree, decorated by the stars from the blow Popeye gave Bluto. ‘Seasin’s Greetinks’ is the first mediocre Popeye cartoon. Compared to earlier entries this cartoon is rather low on gags, and the love triangle already becomes predictable. Luckily, the Fleischers came up with enough variations to keep the series fresh, even if not in all its entries. 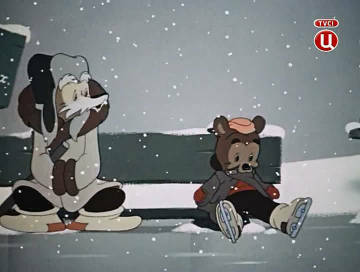 ‘Seasin’s Greetinks!’ is noteworthy for introducing the skating-near-a-waterfall plot, which Disney would copy in ‘On Ice‘ (1935) and the ‘Once upon a Wintertime’ sequence of ‘Melody Time’ (1948). Among the earliest Silly Symphonies there was a cycle devoted to the four seasons. ‘Winter’ is the last of these four season cartoons. Following the artistic success of ‘Autumn‘, ‘Winter’ is unfortunately as dull and plotless as the earlier ‘Springtime‘ or ‘Summer‘. The cartoon both starts an ends with a winter storm. In between we watch animals skating and dancing on Emile Waldteufel’s Skaters’ Waltz. 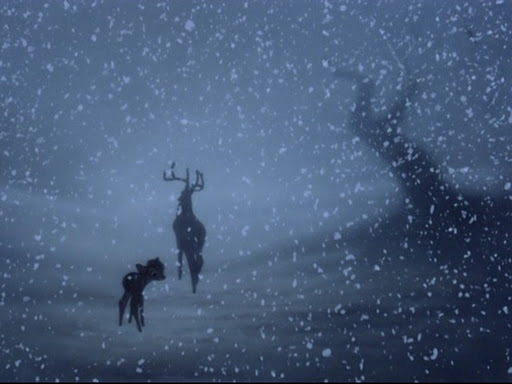 This scene features some deer, which are a far cry from ‘Bambi‘ (1942), but who are more comfortable on ice than Bambi would ever be twelve years later. The cartoon ends when a groundhog sees his shadow again, and cold and snowy winds drive the animals back to their hiding places. It’s winter, and a rabbit, a fox and a squirrel wake up a hibernating little bear to go skating with them. ‘Grandpa and grandson’ is one of the countless harmless children’s films the Soviet Union produced in the 1950s. Unfortunately, it’s not among the best. It’s a slow and sugary film starring many all too cute animals and using a lot of dialogue. Unlike contemporary Soviet animation films it doesn’t seem to be based on a folk tale. Instead, it feels like an overlong Silly Symphony (it lasts almost twenty minutes), ending with a seemingly endless ballet on skates. Because of the slow animation of the characters (typical of Russian films from the era), even this ballet doesn’t really comes off like its Disney models. ‘The Insects’ Christmas’ is Starewicz’s next film after his masterpiece ‘The Cameraman’s Revenge‘. Although the short uses insects again, it’s a whole different film, turning to the sweet subject of Christmas. It’s probably the first animated film about Christmas ever made. The plot is surprisingly simple: Father Christmas climbs down a Christmas tree, awakes some insects and a frog, who are hibernating underground, and he invites them to a Christmas party. He gives them presents and they all go skiing and skating. This film’s story cannot be compared to the mature plot of ‘The Cameraman’s revenge‘. It’s more like a child’s dream of Christmas. The film reuses puppets from ‘The Cameraman’s Revenge’ and others, and even though the animation is less engaging than in Starewicz’s earlier film, it is still of a stunning virtuosity, making the result still a delight to watch. Note, for example, the illusion of wind in the animation of Father Christmas’s coat. On Ice is the first of Disney’s ‘ensemble cartoons’. Everyone is in it: Mickey, Minnie (in her color debut), Donald, Goofy, Pluto and even, albeit very briefly, Horace Horsecollar and Clarabelle Cow. 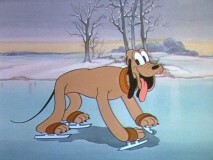 ‘On Ice’ introduces two story ideas that would be used again much later: Pluto’s problems on ice in ‘Bambi’ (1942) and the idea of skating near a waterfall in the ‘Once upon a Wintertime’ sequence of ‘Melody Time’ (1948), although this latter idea first appears in the Popeye cartoon ‘Season’s Greetinks!‘ from 1933. Apart from this, ‘On Ice’ has been very important in the development of Goofy. He’s been completely restyled, has more body to his looks and a much more distinct personality. All these important improvements on the character are attributed to Art Babbitt, one of the greatest animators of all time. Goofy sings ‘The world owes me a living’ from ‘The grasshopper and the ants’ (1934). The song naturally becomes his theme song. No wonder, for the grasshopper and Goofy share the same voice: that of Pinto Colvig. Also of note is Goofy’s original fishing style, using chew to catch fish.